Grab your Christmas bargains as the city stays open for longer this festive period. Christmas has officially been switched on in Sheffield city centre, with help from a few familiar faces, including none other than this year’s Great British Bake Off winner Rahul Mandal. With a jam-packed programme of performances from young local talents, as well as our very own Brearley Bear, Sheffield was electric with excitement for the festive season to well and truly begin. Now that the city is twinkling and poised for Christmas, find out which shops will be opening for longer to make sure we squeeze in as much shopping as possible. Keep scrolling to find out where will be open for longer! 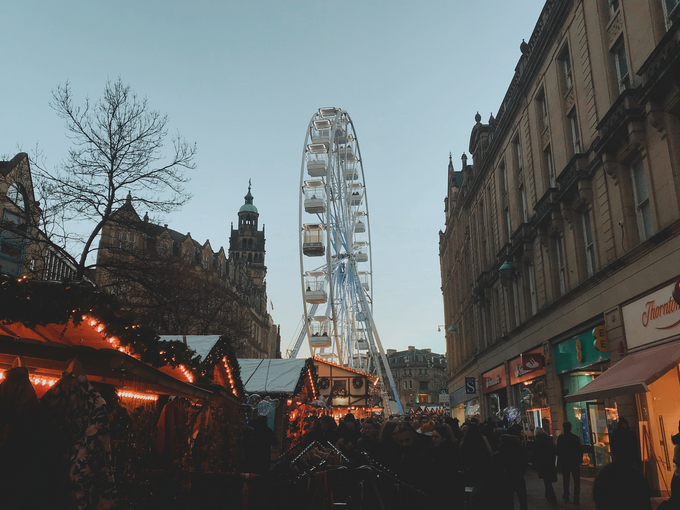 It’s not just the shops that will be open for longer this year – the Christmas Markets will be open from 10am until 6pm every day until Christmas Eve, with more than 50 market traders providing plenty of locally-produced food, drink and gifts – this year 85% of traders are from in and around Sheffield! We haven’t forgotten about the Sleigh Bar - covering all your hot chocolate, mulled wine and other Christmas drinks treats needs from 15 November 10am- 10pm every day until 24 December, head to the bar at the top of Fargate throughout the festive season. Of course, THOR'S tipi bar will be back from 22 November for cosy drinks (and now food!) in the Peace Gardens. Want to know more about shopping in Sheffield city centre after 5pm? You’ll find everything you need here. This Christmas, Sheffield City Council is also offering free all-day Sunday parking in city council on-street pay and display bays and car parks from Sunday 18 November to Sunday 23 December, so you can spend less on parking and more on presents! Q-Park is also feeling generous this time of year, and is offering discounted parking when you pre-book online using the code SANTA15. To find out more about getting into the city by bus or tram, visit Travel South Yorkshire. Special Christmas opening hours in Sheffield city centre (find normal trading hours here). Stay tuned as we’ll be updating this throughout the festive season. From 3 - 22 December = open until 7pm (except for Sundays, which will remain the same). Fed up of shopping already? Take the kids over to Santa's Post Office on 15 Barkers Pool for a free festive experience (and respite from all that shopping!). The interactive Sheffield Christmas Trail is also a great way to get into the Christmas swing with the whole family. Find out more by visiting www.sheffieldchristmastrail.com, or by following Brearley Bear on Twitter.